In his current position, Jeff Eisensmith leads through collaboration with the DHS CISO Council, a body of component CISOs. He works to mature policies and strengthen the information security posture of the department – setting vision and strategy while maintaining compliance with the Federal Information Security Management Act of 2002. He now serves as co-chair for the Joint Continuous Monitoring Working Group. 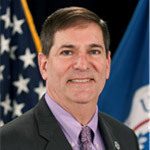 Eisensmith came to DHS Headquarters from Immigration and Customs Enforcement where he served as CISO and acting Engineering Division Director. Prior to ICE, he worked at BAE Systems. He brings experience from both offensive and defensive information operations.